This week, the Old Boat Column presents an action-packed image; it was taken at the Davis Island Lock and Dam, the first such structure on the Ohio River. The viewer can vicariously smell the smoke and hear the chuffing steam of the ‘scape pipes as, in the foreground, the towboat Harry Brown is mightily shoving a tow of empties out of the lock chamber. Downbound, in the distance, is the towboat Boaz with a loaded tow, having just run the pass on a high stage of water. Prancing about at the left is the short-trade packet F.A. Goebel. The head of Neville Island shows above the Goebel, and the lower end of Davis Island is at the extreme left. There were two steam towboats named Harry Brown. Both were owned by the William Brown family of Pittsburgh, which operated 40 towboats between 1858 and 1919. The first Harry Brown was built in 1879 at Pittsburgh. The big sternwheeler was constructed on a wooden hull measuring 210 feet in length by 49.6 feet in width. Seven boilers supplied steam to engines having 26-inch cylinders with a 10-foot stroke. Engaged in southern towing operations, the steamboat was the scene of a tragedy early in its career. In 1880, Capt. Pat McCallister (of the towboat J. Sharp McDonald) came aboard the Brown at Natchez for a visit. When he jokingly picked up a gun in the pilothouse and pretended to pitch it overboard, the firearm discharged, killing the riverman. In 1896, while upbound at Vicksburg, the boilers exploded; the vessel immediately broke in half and sank within five minutes, killing 11 crew members. The roof bell was salvaged from the wreckage and donated to St. Catherine’s Church at Pittsburgh. Built in 1882, the hull (193 feet in length by 44 feet in width) was constructed at Sewickley, Pa., with the remainder of the boat being completed at Pittsburgh. The Boaz was a powerful vessel with a rating of 1,433 indicated horsepower, when a 300 hp. boat was considered adequate for most towing jobs at the time. The boat usually departed Pittsburgh with a tow of 30 barges and coalboats, most of which were destined for Pumpkin Patch, a large landing shortly upstream from the Howard Shipyard at Jeffersonville, Ind. 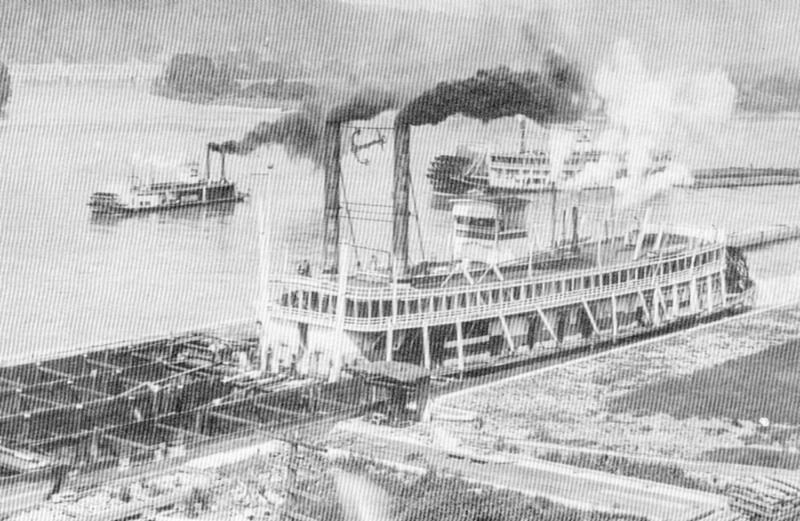 The sternwheeler had a notorious reputation for losing coal and in 1895, spilled an entire tow of 14 loads above Hawesville, Ky. The Boaz was retired in 1916 and relegated to a boneyard until 1925, when it was dismantled. Originally named R.E. Phillips and built at Freedom, Pa., in 1886 (on a wooden hull measuring 110 feet by 20.2 feet), the boat sank in the ice at New Matamoras, Ohio, in 1894. The riverboat was raised (the upper cabin was removed) and sold to Capt. Will Duffy, who renamed it F.A. Goebel to honor a furniture man in Marietta, Ohio. The boat sometimes operated under charter, eventually changing ownership several times and later towing timber out of the Big Sandy River. The Goebel was later taken south and sank at Monroe, La., on August 23, 1907.